Mind Bending Follow-up to Toxic Games First-Person Puzzle Adventure. Q.U.B.E. 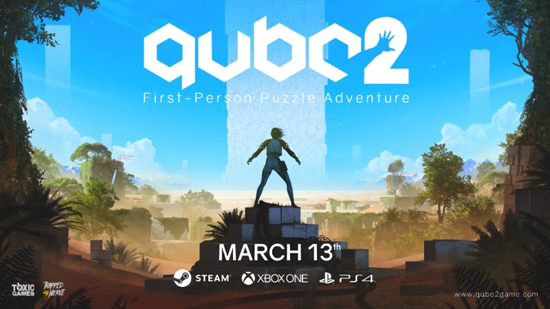 2 offers a brain-teasing adventure for fans of the original Q.U.B.E. and newcomers alike. This follow-up features an all new cast of characters, putting players in the role of archaeologist Amelia Cross as she awakens in an alien world with no memory of how she got there. Armed with a special pair of gloves that let her manipulate the environment, Amelia must navigate a monolithic structure filled with alien technologies in search of another stranded scientist, Emma Sutcliffe, to whom she communicates with via radio. Together they must find a way home. Over the course of 11 Chapters, players will step into Amelia’s shoes, exploring the structure and solving its puzzles to progress. Combine the abilities of the “manipulation gloves” with the alien architecture of the monolith for an open ended gameplay adventure featuring over 80 puzzles. In a story that explores themes of trust, isolation and humanity, thought-provoking questions about Amelia’s true purpose and the origins of the structure will need to be considered, forcing her to come to terms with a devastating truth that will shake her world.